Biochemistry: The Chemical Reactions of Living Cells is a 16-chapter reference source on chemical structures and reactions of living cells. The first three chapters of this book contain introductory material on cell structure, molecular architecture, and energetic. The subsequent chapters examine the allosteric effect of the binding structures of oligomeric enzymes, microtubules, viruses, and muscle. These chapters also describe the structures and chemical properties of membranes and of the surrounding cell coats. The discussions then shift to the general properties of enzymes, the kinetics of chemical reactions, and the various mechanisms employed in enzymatic catalysis. 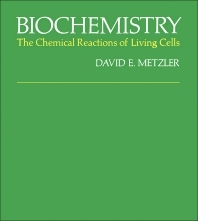 Considerable chapters are devoted to the reaction sequences found in metabolism. These chapters particularly examine the carbohydrate and lipid metabolism; photosynthesis; and biosynthesis and catabolism of an enormous number of nitrogenous compounds. The final chapters highlight the genetic and hormonal control of metabolism, development, and brain function. Biochemistry teachers and students will find this book of great value. A. ATP and the Nucleotide "Handles"
F. Fermentation: "Life Without Oxygen"